There seems to be a lot of interest at the moment regarding saving for your children’s futures with people trying to decide between the Government’s Child Trust Fund, (CTF), and pension contributions so we thought we’d set out the tax advantages of each for you to discuss with your Financial Advisor. A s you are no doubt aware CTF’s were introduced in April 2005 and apply to children born after 1 September 2002 so if your child is older than this and you don’t plan on having any more, then this section will not apply to you. If you are eligible then you will have received a voucher worth £250* shortly after your child was born with a further £250* due when your child is seven. These vouchers can then be paid into a CTF in your child’s name. 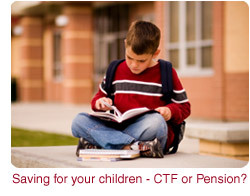 Your child’s CTF will then be invested in the stock market, across a broad range of investments designed to reduce risk, until they are 18 when they have full access to the funds and can spend them as they see fit. In addition to the Government’s contributions a parent can make further contributions of up to £1200 per annum. Before the latest changes to pension legislation it was only possible to make pension contributions if you had sufficient net relevant earnings. As children rarely have earnings, pension contributions were not possible. However, it is now possible to make pension contributions of up to £3600 gross per annum without any earnings. Some parents have taken advantage of this and have started a pension scheme for their children. Some are paying in the maximum amount possible whilst some are simply paying in the child benefit that they receive each month. So what are the advantages and disadvantages of the Child Trust Fund? Well, you receive £500 tax free from the Government, which is always a nice thing, but your child will have total access to the fund at age 18 to spend as they wish. You may have contributed the full £1200 per annum for 18 years so the fund could be worth in excess of £22,000 without any growth with £500 of this contributed by the Government. Some parents might be comfortable with their 18 year old having access to this amount of money but I suspect they are in the minority. So let’s have a look at pensions. If you were to invest the same amount as you are allowed to with CTF;s, i.e., £1200 per annum, HMRC would top this up with £300, being the basic rate tax credit. Therefore, over the full 18 year period the fund could be worth £27,000 without any growth; with £5400 contributed by the Government. Furthermore this amount will continue to grow tax free until your child is 55 as they are unable to access the monies before this age. They can of course start to contribute themselves once they are earning in their own right. It is clear that there are tax advantages to saving for your child through a pension scheme and for most parents, it provides the security that their child cannot access the monies until they are older. * An additional £250 may be made to those on low incomes. Freestyle Accounting is not licensed to provide investment advice. Please consult your Financial Adviser before making any investment decisions.